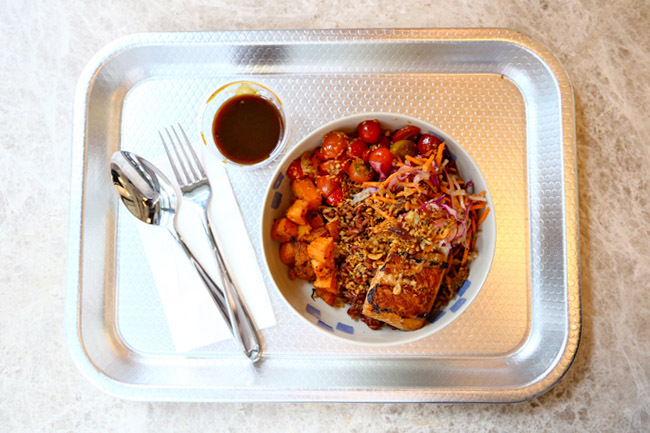 Pick your grains, select a protein and vegetables, complete with sauce and toppings. Pay up, mix your grains and eat it. This is Grain Traders. This sounds almost like ordering Chap Cai Png from the economical rice stall, except that this is not the usual epitome of ‘economical’. 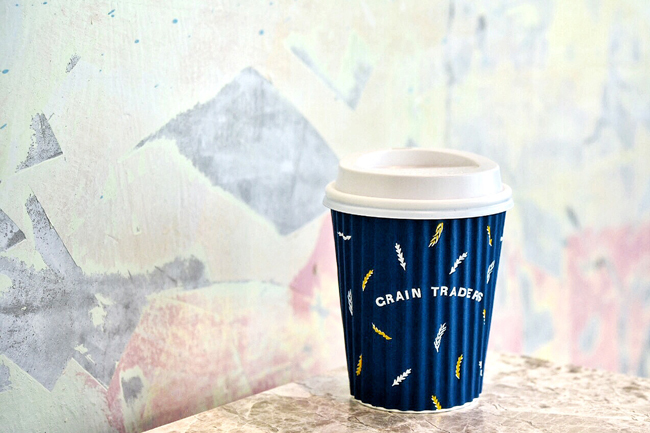 Grain Traders understands what its target diners, the CBD crowd wants – healthy breakfast, build your own bowls, bagels, cakes, coffee all in a single place. Ticking all the right boxes at the same time. 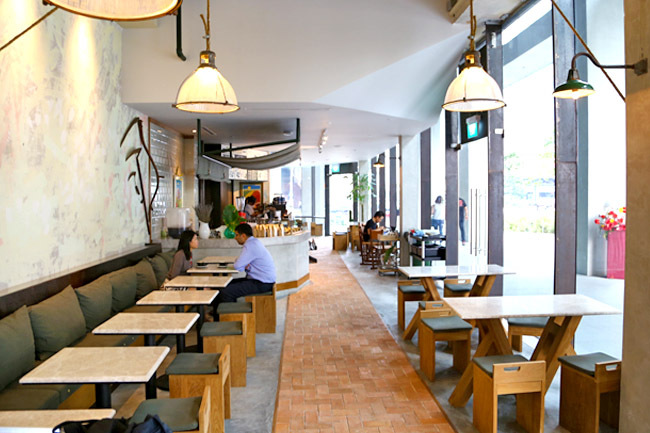 From the team behind Kilo and Kilo at Pact, the casual joint is located at CapitaGreen Building along Market Street, next to House Of Taste HOT. Note that both Apple and Google Maps have no indication of this building, yet. 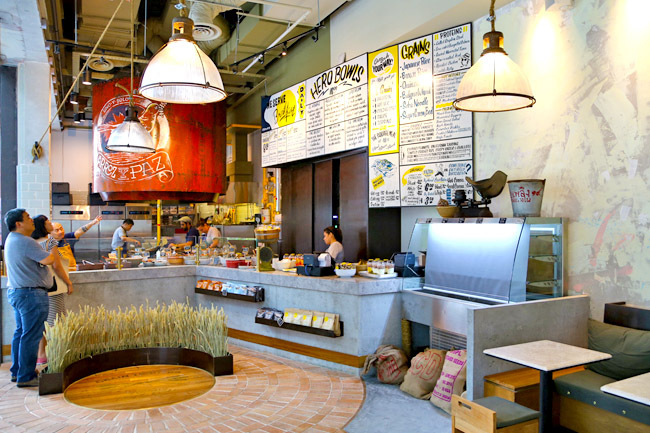 Grain Traders occupies 3 shop spaces with 2 ordering counters – one for the light bites of for coffee and bakes; the other more substantial for grain bowls. 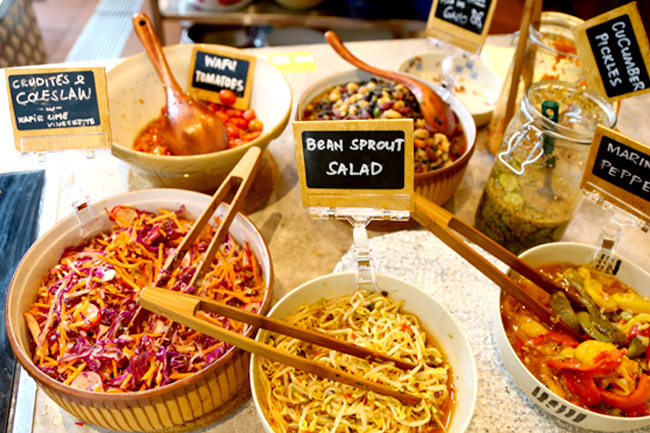 Price of the bowls is fixed at $16 nett, more expensive than the typical salad bowls, but has incorporation of more elements. The food is laid out in huge bowls and containers. Just like in a marketplace, you get to choose your freshest ingredients visually, and make your payment at the end of the counter. One grain, one protein, one hot veggie, one cold veggie, one topping and one sauce to complete the bowl. If you are not so much a rice person, quinoa, soba noodles and greens are available as the base. Personal take: The sauce is too important an element, and will decide if the final mix is one you will enjoy. FYI, there are choices of Tamarind Chipotle Vinaigrette, Coconut Curry, Wasabi Sauce, Beetroot Feta Yoghurt, Salsa Verde, Basil Vinaigrette, Miso Caramel and Asian Gravy. Breakfast is served from 8am to 10.30am daily whereas lunch is only available 11am onwards. 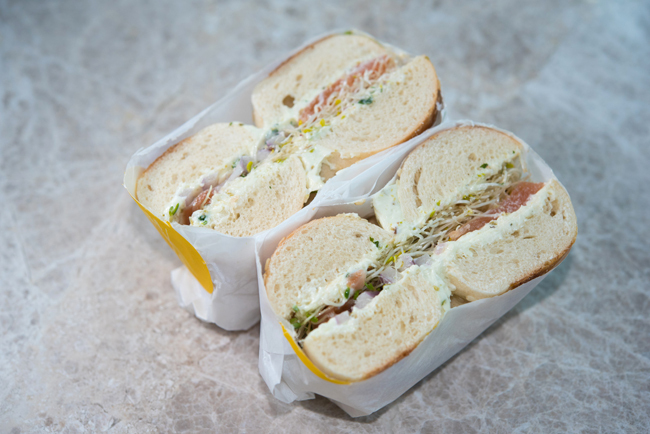 Only 4 items are available for breakfast: Eggs ($8), Porridge ($8), Oatmeal ($8) and Bagels ($10). 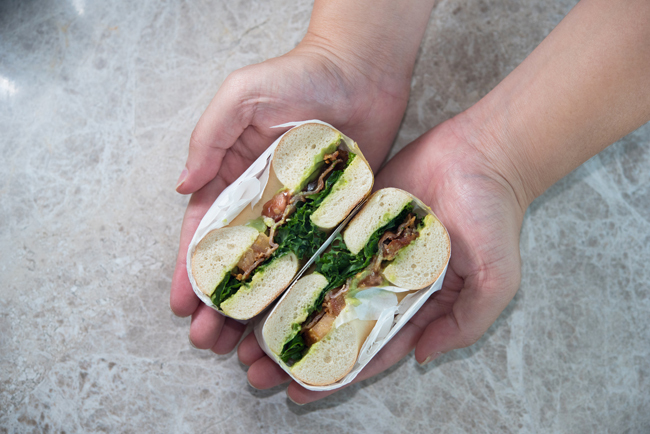 We ordered the Guacamole BLT Bagel ($10) that came with bacon, tomatoes and baby spinach. Balanced taste, not overwhelming and agreeable contrast in texture between the crispy bacon and the chewy doughnut-look-alike bagels. 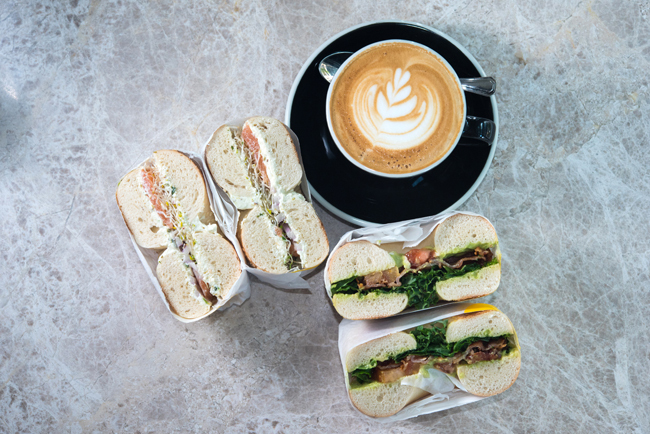 The Tequila-Cured Salmon Bagel ($10) with cream cheese, red onion and alfafa sounds interesting for those who need a wake-me-up-alcohol (not too overpowering to make one drunk early in the morning though). For those looking for takeaway coffee, the usual suspects are available: Black ($4), White ($5), Small White ($4) and additional $1 for iced, soy, mocha, decaf are available. Coffee is supplied by Papa Palheta group, which is fast growing its own ‘conglomerate’. Its coffee is almost everywhere. (We may be exaggerating but you get the point.) The coffee was smooth with a nutty, pecan and grapefruit tone. Black Cold Brew ($7) and White Cold Brew ($7.50) are available to combat the heat. Stocks are only replenished at the start of the week so grab it fast before it runs out. Lunch time was a busy sight, from the cooks to the barista and to the traders (men and women in business suit) exchanging information on their latest forex trading. 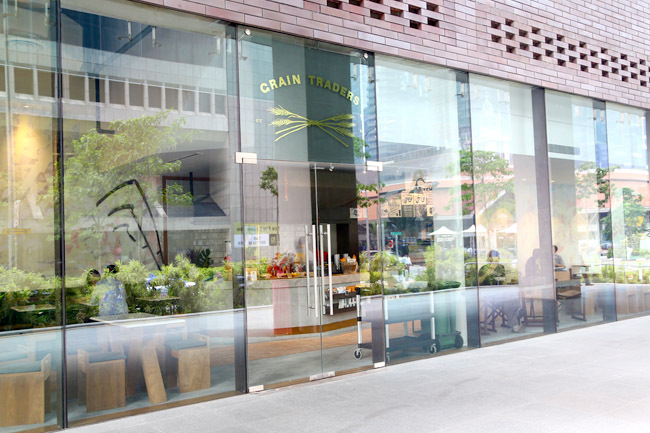 We recommend going during off-peak hours if you can afford it, because some diners may take a protracted duration to pick grains and sauces, as though they are making life’s greatest decision. 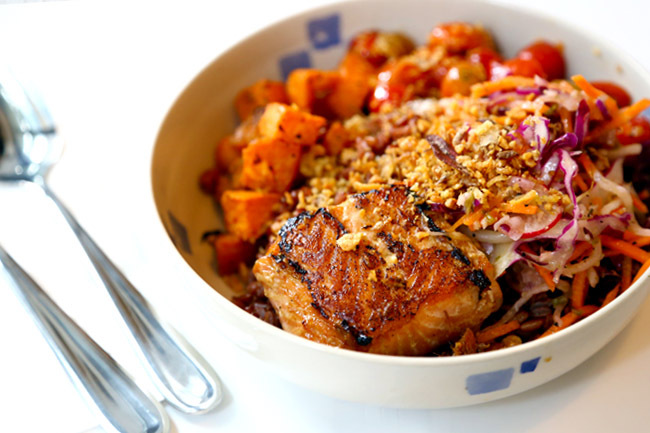 * Written by Nicholas Tan @stormscape and Daniel Ang @DanielFoodDiary. You can find them on Instagram, Snapchat and Weibo. Search via their userid now!